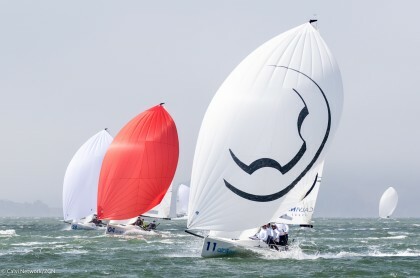 Three races were held on Berkeley Circle for the 68 international teams competing in the J70 World Championship on Wednesday. The conditions were once again, true San Francisco. The fog was lurking if not covering the race course, the wind had bite, and blew 14-18 knots. There was a big left shift in the last race that caught more than one local off guard. In race one, 13 year old Gannon Troutman on his Pied Piper led wire to wire. This is fantastic to have such youth competing in events like this. 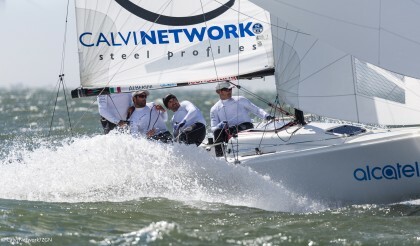 We, on Calvi Network, made a good comeback. after rounding the last mark 7th, we gybe set and came into the finish line hot to just nip Petit Terrible and Flojito to the second place. Races two and three belonged to Flojito. The Mexicans were very fast and sailed well. 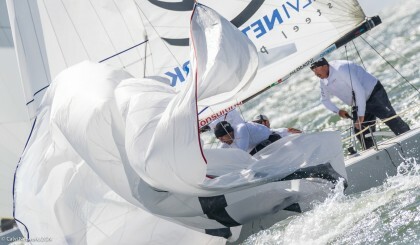 In the second race they had a 1:15 second lead at the first mark and sailed off into the horizon. We managed a 7, and 3 in the last two races to make for a good day . We are now in 4th overall. Fernandez and Judd Smith on his Africa are tied for the lead with 21 points. 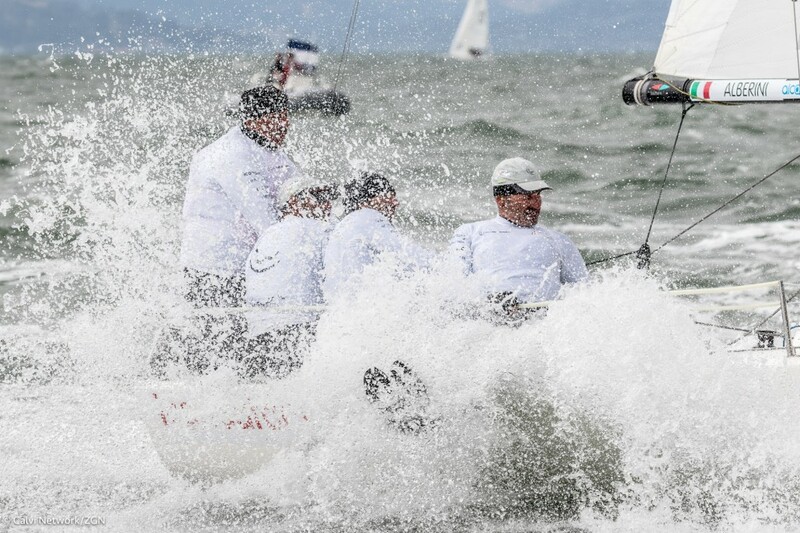 Claudia Rossi is in their with 27 point and we are in 4th with 36 and Matias Seguel of Chile is in 5th with 50 points. After today’s first race we will be at the half way point in the regatta and each team will discard their worst finish. There si still a lot of racing left. The fog is covering the entire bay this morning. I think the wind will be in this afternoon but with an 11:00 first start, it could be a bit light in the first race and the left usually features in the building breeze.